Following last issue’s article ‘Scuba’s Scary, Right?’ I thought it would be a good idea to delve a little further into investigating this underwater sport. The following tries to answer some of the most common questions asked about scuba diving. Scuba Diving FAQs #1: What is scuba? Scuba stands for ‘Self-Contained Underwater Breathing Apparatus’. It is a unique activity where you can experience the wonders of the underwater world without having to come up for a breath every 30 seconds or so. 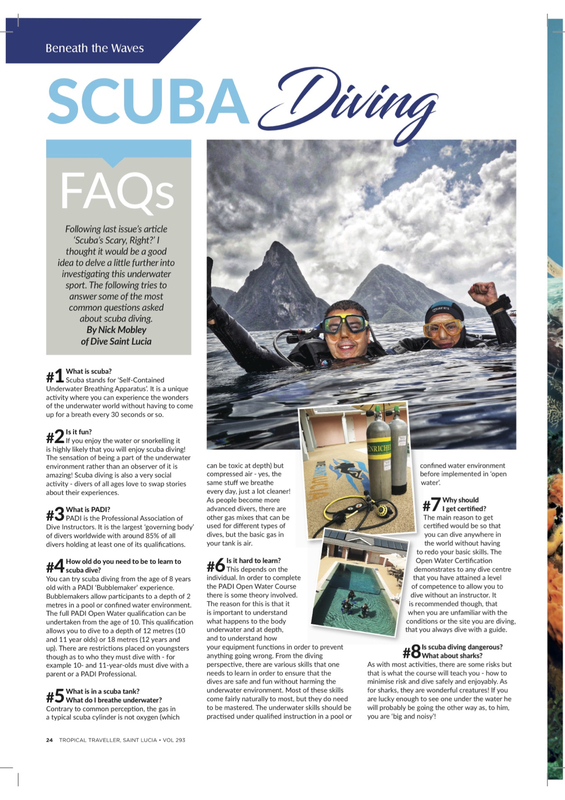 Scuba Diving FAQs #2: Is it fun? If you enjoy the water or snorkelling it is highly likely that you will enjoy scuba diving! The sensation of being a part of the underwater environment rather than an observer of it is amazing! Scuba diving is also a very social activity – divers of all ages love to swap stories about their experiences. Scuba Diving FAQs #3: Who are PADI? PADI are the Professional Association of Dive Instructors. They are the largest ‘governing body’ of divers worldwide with around 85% of all divers holding at least one of their qualifications. Scuba Diving FAQs #4: How old do you need to be to learn to scuba dive? You can try scuba diving from the age of 8 years old with a PADI ‘Bubblemaker’ experience. Bubblemakers allow participants to a depth of 2 metres in a pool or confined water environment. The full PADI Open Water qualification can be undertaken from the age of 10! This qualification allows you to dive to a depth of 12 metres (10 & 11 year olds) or 18 metres (12 years and up). There are restrictions placed on youngsters though as to who they must dive with – for example 10 & 11 year olds must dive with a parent or a PADI Professional. Scuba Diving FAQs #5: What is in a scuba tank? What do I breathe underwater? Contrary to common perception, the gas in a typical scuba cylinder is not Oxygen (which can be toxic at depth) but compressed air – yes, the same stuff we breathe every day…just a lot cleaner! As people become more advanced divers there are other gas mixes that can be used for different types of dives, but the basic gas in your tank is air. Scuba Diving FAQs #6: Is it hard to learn? This depends on the individual. In order to complete the PADI Open Water Course there is some theory involved. The reason for this is that it is important to understand what happens to the body underwater and at depth and to understand how your equipment functions in order to prevent anything going wrong. From the diving perspective, there are various skills that one needs to learn in order to ensure that the dives are safe and fun without harming the underwater environment. Most of these skills come fairly naturally to most, but they do need to be mastered! The underwater skills should be practiced under qualified instruction in a pool or confined water environment before implemented in ‘open water’. Scuba Diving FAQs #7: Why should I get certified? The main reason to get certified would be so that you can dive anywhere in the world without having to redo your basic skills. The Open Water Certification demonstrates to any dive centre that you have attained a level of competence to allow your to dive without an instructor. It is recommended though, that when you are unfamiliar with the conditions or the site you are diving that you always dive with a guide. Scuba Diving FAQs #8: Is scuba diving dangerous? What about sharks? As with most activities, there are some risks, but that is what the course will teach you – how to minimise risk and dive safely and enjoyably! As for sharks, they are wonderful creatures! If you are lucky enough to see one under the water it will probably be going the other way as you are ‘big and noisy’!